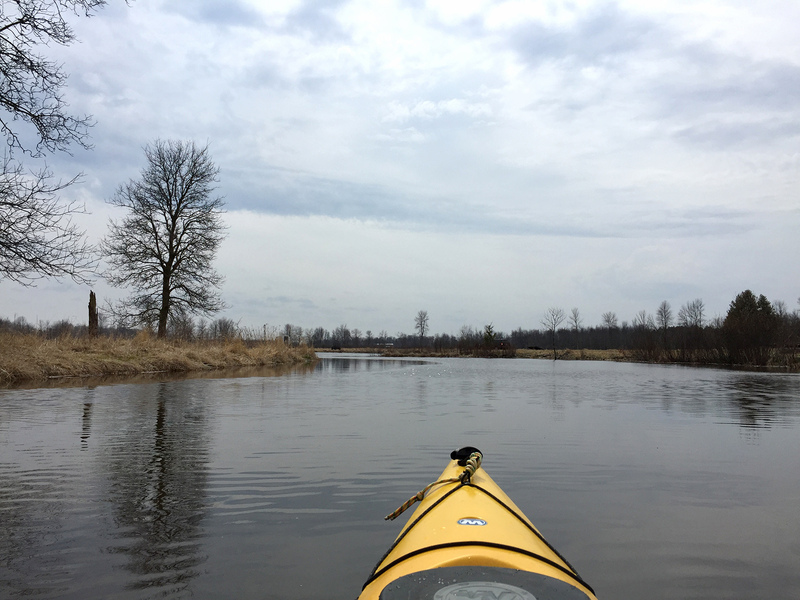 The Ahnapee River is a flatwater paddle in a wide, sometimes marsh-like estuary – perfect for silent sport enthusiasts. Dammed at Forestville it gently winds its way to its ultimate destination with Lake Michigan. With a convenient waves-to-trails bike shuttle via the Ahnapee River Trail, this trip (though uneventful), is a nice option to consider while visiting the Door County peninsula. Time: Put in at 12:10p. Out at 2:50p. Wildlife: Ducks, geese, seagulls and various (and hundreds of) fish. Door County offers all sorts of great kayaking opportunities but the popular destinations are usually relegated to the shoreline because as the Door County peninsula grows narrower, there are naturally fewer rivers and creeks to explore. Yet there are still some routes to paddle inland, like the Ahnapee. And this one located about a third of the way up the thumb, offers a pleasant estuary paddle. With that, since I was in the area and since I’m always looking for something new to explore, it was time to check venture the Ahnapee. The put-in near the dam is shallow and rocky. Upon my arrival (early in spring), it happened to be teeming with hundreds (literally hundreds) of suckers trying to make their way upriver. I literally (but gently) put my kayak in on a bed of fish. It was bizarre. I tried my best to scoot and cajole to very little avail so as not to harm any of them. After setting off we both slapped each other – me with my boat going downstream – and them with their tails going upstream. It was like a four-lane highway condensed to 1 lane but comprised of a kayak going one way and hundreds of fish going the other. There was a bit of fun within the first few hundred yards of the put-in where you’ll find the only riffles of the day. It’s also the most intimate you’ll encounter before it opens up after the Main Street/County Road J bridge. As Kark suggests, there isn’t a whole lot to see regarding scenery, especially in early spring where banks are brown and lifeless. But sometimes the unremarkable makes for a great paddle. And there’s beauty in cattails and nests and clumps of marshy estuary sod and mud and grass. The current too, is virtually non-existent and the time it took me to paddle 8.25 miles reflects that – clocking in at 2 hours and 40 minutes. I only dealt with a light wind but windier days could make this a much longer paddle with nothing to really block the wind along either shore throughout. I was also trying to fit this between some spotty (and dark) storms that were combing the area. Luckily, my gamble on the window paid off but there were some hairy moments where I saw some thunderstorms in the distance. This is a wide river and after the County Road X bridge, it gets wider, then increasingly wide all the way to downtown Algoma. Despite Highway 42 shadowing the river-left bank most of the trip, vehicle noise wasn’t very noticeable until after Washington Road, which is essentially the halfway point. Before the smokestacks signal your approach to Algoma, you’ll enter a very wide, almost lake-like point in the paddle. It’s a slow stretch until a dog-leg left where it narrows and where you’ll also find an alternative access point (located just off Highway 42). It probably was a nice park at some point but now it’s a just a huge gravel parking lot with some closed and run-down buildings. (I’m guessing restrooms?) There were a few fishermen out that day along the bank with a line in the water. Canoers may well be advised to take-out at this alternative access point because boat traffic in the harbor could make for some difficult maneuvering depending on how busy it is. The beach take-out would be a preferred landing if Lake Michigan is calm enough to paddle out to (which unfortunately it wasn’t on this day). The distance from the alternate access point to Algoma isn’t very far. Along the left bank, there were some rough and tumble docks barely clinging to their respective homes. Factories and industry align the right bank. Algoma itself felt a bit run-down with these mills and their debris scattered along the land, though I actually always find towns like that kind of appealing for that reason. Soon, the red lighthouse appears in the distance on the left, as well as the harbor walls on the right. The pier is beautiful, as is the red lighthouse that punctuates the harbor entrance/exit. I ended up paddling around and into the harbor, taking-out on a retaining wall of rocks. Lake Michigan was too fierce that day (more on that below). There’s just something kind of cool and appealing about paddling a river into a body of water as big as Lake Michigan, despite how slow-moving the trip itself was – it’s pretty unique. The additional ease of a dedicated shuttle made it all the more appealing. After the shuttle – a lovely waves-to-trails journey along the Ahnapee State Trail – a stop in Algoma wouldn’t have been complete without a trip to the Ahnapee Brewery. There, in a converted garage (yeah, it’s small) you’ll be treated to some excellent brews and some elbow-to-elbow camaraderie due to its popularity (and again, literal size). The take-out in the harbor isn’t ideal. The beach landing at the Crescent Beach Boardwalk next to the harbor was my intention and would be more appealing but the wind caused the surf to be so incredibly forceful, it would’ve been foolish. The waves were 4-5 feet and quite intimidating. There was a small craft advisory in place so I knew I needed to be smart about this – I didn’t feel the desire for the Coast Guard to rescue me in that cold water. Coincidentally, on this same day, a paddler was rescued from the waters further down the coast of Lake Michigan near Kenosha. Paddling within the harbor can be a bit dodgy even with the protection of being within it – there were gentler but still forceful waves coming through the harbor channel that make turning a your boat a bit of a challenge, but also because of boat traffic. While I kept my boat as close to the harbor wall as I could, two boats came around the corner – a very blind corner at that – and weren’t as far right as they probably should’ve been. I got a little freaked out by how close they chose to exit, though I get that they probably weren’t expecting a paddler coming around the corner. Though if I were a bigger boat, then they were taking that exit waaaay too tight. Luckily it all worked out since I would’ve lost that collision any day of the week. Lastly, it was cold in Algoma though completely humid at the put-in in Forestville. There is really something to be said about that 10-mile temperature difference from the lake to further inland. Though it’s a relatively slow adventure, the Ahnapee River will appeal to paddlers who appreciate nature at its barest. And it is a nice option to consider for canoeists and flatwater kayakers traveling through the Door County peninsula. If the wind and conditions were right, (meaning no wind whatsover) I’d love (and prefer) to take-out on the beach once paddling into Lake Michigan. The shuttle was absolutely delightful. After a very small jog through Algoma, you’ll follow the Ahnapee State Trail all the way to the put-in back at (the creatively-named) Dam County Park in Forestville. The trail was a little rough but probably because it hadn’t been groomed yet since it was still early in the year. The put-in below the dam. Riffly and narrow for a very short stretch. Intimate too, for a short bit. County Road J/Main Street bridge. No idea what these things are. Some mighty large rocks alongside the upstream side of the bridge. Very pretty scene heightened by the swirling storms I was dodging. This is very typical scenery. The Ahnapee State Trail bridge. One of a dozen goose nests/beds/mounds. Washington Road bridge (useable as an access point). The ensuing stretch towards Algoma is a very long and wide section. Soon, smokestacks will appear, signaling that you’re near Algoma. Lots of dock work to be done. It was choppy within the harbor. View from my corner of the harbor take-out. My intended take-out was the beach. This picture doesn’t do justice to how intense the waves were. One last look at the lighthouse.